OK, I promise, I'll stop mithering on about laptop bags after this post. But I wanted to highlight one last project, which really is worth a minute of your time. The You've Got Mail bag is a Kickstarter project from Hearts.com, out of Phoenix, Arizona. They've come up with a new spin on the upcycled messenger bag. The You've Got Mail is made from old sturdy US Postal Service sacks, that have been lovingly resewn, dyed and formed into something a bit special. Old design features like the retro graphics peek out of a fresh dye job, and the grommets that were initially used to secure the bags become a handy headphone or power port. The bags have plenty of pockets and storage space, and are of course well padded to keep your technological darlings safe and snug. The straps are made from sturdy old seatbelts. The design is clean and modern with (ahem) bags of old-timey charm. Most importantly, the nature of the process means that no two bags are alike. Your YGM will be the only one like it on the planet. The green creds of the You've Got Mail are equally impressive. They're reducing waste sent to landfill (saving 5 tons so far), using locally sourced material and an all-US workforce. This is a sustainable, forward-thinking business model that deserves your support. And you can do just that. The Kickstarter that Hearts have set up offer all kinds of rewards, from a simple 'thank you' if you throw them a buck, to having the whole production run named after you. Of course, you could always just snag the bag at a cheap early-bird price. And bear in mind, if Hearts don't make their fundraising target, you don't get charged. I'll be keeping an eye on this over the next month or so. At the time of writing, the project has 28 days to go, and is just over 10% of the way towards its $10,000 target. That seems like an easily reachable goal to me, but it needs interested parties like you to show support for a business venture that just needs that little bit of seed capital to get off to a great start. One last thing. This is the View's 300th post. Let me just take a moment to thank everyone that regularly reads and comments on the blog. It's very much appreciated. We're taking a few days off (bank holiday DIY, naturally) so we'll see you again next Tuesday. Happy Easter, readers! You hear a lot about eco-friendly companies offering to take back and recycle their clothes when they're worn out. But what does that mean in real terms? What's the end product of all this re-tasking? Nudie Jeans, the Swedish denim brand that I talked about last spring, have the answer, which their rolling out to their stores worldwide next month. They've come up with a limited run of Post Recycled Denim Rugs. They've been carefully put together from a huge batch of old Nudie Jeans that have been cut into strips, stitched together and rolled onto spools. These are hand-woven at Nudie's denim suppliers in Turkey, which minimises stock movement and the possible intervention of greedy middlemen. The look is deliberately rough and ready, with the distinctive striped effect coming about as a direct result of the manufacturing process. But you just know how good that beaten-up denim is going to feel underfoot, right? Nudie are coming to the UK in the spring, but it's doubtful that they'll be stocking the rug. So if you want to be sure of getting your hands on one, you'd best jump on a plane post-haste. For more on the world of Nudie Jeans, check their website, which has loads on their worldwide initiatives. We've had a bit of an upgrade here at the end of The Pier. As your humble writer is doing much more video work, the poor old Macbook which he's mercilessly thrashed over the last five years is sadly no longer fit for purpose. It was with a slight air of melancholy, quickly replaced with unseemly whooping and running about, that the social media office of Pier32 took delivery of a lovely new Macbook Pro. It's been put straight to work, with the new Starworld video being the first of many promotional shorts that we plan to regale you with. Mobility is all important in the fast-changing world of bloggery, facebookism and twitterology, and a cool new laptop is no good if you're lugging it around in a Tesco's carrier. So I'm in the market for a new laptop bag. There are a couple of options that have my eye, one of which is currently under test. More on that soon. But let's have a peek at the Juan Valdez, a bag from the Utah-based Apple tote specialists Colcasac. Loosely based on their iconic Applesac, it's made from burlap, lined with jute, with a soft fleece lining of recycled polyester. 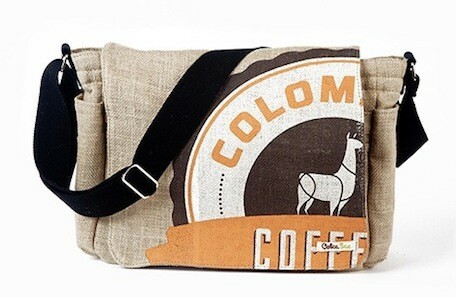 The styling is reminiscent of old coffee sacks, which pleases a raddled caffeine addict in me. Burlap and jute are, of course, eminently sustainable materials, and beautifully hard-wearing. The Juan Valdez is a bag that'll be with you for the long run. 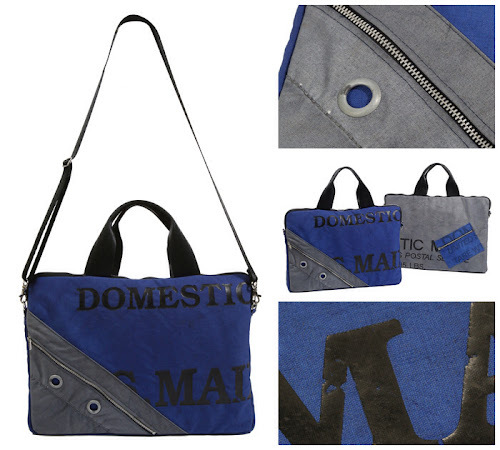 The bag is roomy, and highly practical. The central compartment is big enough to get two 13" Macbooks in if you had a mind. There's certainly enough room to fit everything I use for Pier32 into the one object. There's nothing flimsy about the strap, either. Wide and adjustable, it'll let you lug all your stuff around in comfort. I'm sorely tempted by the Juan Valdez, named after one of the great Columbian coffee pioneers. Colcasac do a great range of sleeves and covers, all with a simplicity of design and focus on practical good looks that I find most pleasing. If you're in the market for something nice for your new Apple device, these guys are definitely worth a look. Last month I wrote about the brilliant new SIM-only phone network set up by the WWF that was helping you with your bills and the world's wildlife to survive. That sweet deal just got a little bit nicer. This month WWF Wildlife Mobile is giving all new and existing customers 60 minutes of free calls so they can tell their friends about Earth Hour. WWF's Earth Hour is a unique annual phenomenon that focuses the world's attention on our amazing planet, and how we need to protect it. At 8.30pm this Saturday, 23 March, hundreds of millions of people will turn off their lights for one hour, on the same night, all across the world in a huge, symbolic show of support. To help you, and your friends, ‘do it in the dark’ WWF Wildlife Mobile is offering everyone an hour of free calls to UK landlines and mobiles. By using your WWF Wildlife Mobile you’ll be helping to protect wildlife across the globe. Every call makes money for conservation, and it doesn’t cost you a penny extra! By using your WWF Wildlife Mobile for an hour you could pay for 36 tree seedlings to help critical areas of tiger habitat. Wildlife Mobile gives 10% of its net call revenues to conservation charities, making it an ideal choice for the growing number of people with an interest in, or a concern for, the environment. It’s open to anyone, and it's really easy to sign up. The new, SIM-only, mobile network from WWF promises ‘every conversation helps conservation’. It offers cheaper standard Pay As You Go rates than the other major networks, plus a range of competitive Bundles of calls, texts and data – saving you money while it saves the planet! Find out more about Earth Day. It's late. A dark night. The streets are empty. You are with a group of people you don't really know, edging your way towards light and safety. Suddenly, there is a growl and a moan behind you. Something breaks out of the shadows and lurches towards the group. Its face is dead white. Its eyes are wide and staring, the pupils mere pinpricks. There is blood on its jaw. A zombie. It's spotted you. It's quicker than you thought. And suddenly you're running, all attempts at stealth gone. You hear a scream as the creature closes on one of your party that was a little slower than you. It's too late for them. But there's still a chance for you. As long as you can survive... for 2.8 hours. 2.8 Hours Later stage zombie experience games up and down the country. In the heart of some of Britain's biggest cities, they put together an evening that's as close to the Z-Day apocalypse as you'd ever want to experience. It's a fully-staged adventure that could go either way. There's a chance that you could end up on the side of the undead. For 2013 they've rewritten the rules for the new game, "Asylum", which rolls some intriguing social commentary and uncomfortable choices into the roleplay. This isn't just a dressed-up version of tag. The Pier32 connection to the asylum? We've done t-shirts for the crew for the last couple of years, and we'll be doing the same again for the 2013 season, which started yesterday in Nottingham. The undead roadshow moves through Birmingham, Glasgow and Manchester, before finishing in Liverpool in July. There are more dates to be announced, which gives you plenty of opportunities to run the gauntlet. You could even volunteer to help run the game! Check out the video to see what you can expect at a 2.8 Hours Later event, and hit up the website to snag tickets. The Nottingham stage runs until Saturday 23rd March. We're very proud of our suppliers here at The Pier. We carefully choose manufacturers with strong ethical principles and provable commitment to sustainable processes. I'm happy to note that one of our big names, Starworld, have recently refreshed their range for 2013, and also gained Sedex certification. This is big news, as it means the company's entire supply chain is clearly shown to be ethically responsible. Sedex makes the often murky waters of the global supply chain crystal clear, allowing customers to quickly see how their clothes are sourced and manufactured. This is vital as customers demand more transparency from the brands they know and love. We thought we'd celebrate by putting together a quick video look at Pier32 and Starworld. Hope you like it. Friday's edition of Comic Relief was yet again, a resounding success. Over £65 million in pledges and donations make it, for the charity sector, the success story to emulate. But in a lot of ways it's an outlier, the point on the curve that doesn't make sense. On the whole, the news for charities is grim. They are being asked to do far, far more with much, much less. Meanwhile, the amount given to charity each year by the public and other benefactors is dropping. As their funding is slashed, their remit from the government is ever urgent; find a way to do your job more efficiently. So are there ways in which charities can use the Comic Relief model to help their funding efforts? Well, yes, in a way. As long as we bear in mind just what an unusual example Comic Relief actually is. A survey published last week in The Guardian showed that people are more likely to give if they have a better idea of where their money is going. Transparency is vital. If people feel that a charity can clearly explain how their donation is used, and that the money they give does actually make a difference, then there's a much better chance that they'll put their hands in their pockets. Comc Relief have always been good at this, regularly devoting hours of TV programming to show where the money they raise is going, and what it's doing, from Tanzania to Tyneside. There's also more chance of a donation being made if you're persuasive and make it easy to pay. Again, Comic Relief is great at this. There's a solid push towards the final night's events for months beforehand, with massive cross-platform promotion in print, TV and online. You can donate online, through any bank, via street collection, and most importantly for the 18-34 year old demographic, via text message. If you make donation a process that can be done in seconds without moving from your sofa, then you're much more likely to get money. There's a flip side to this, of course. Comic Relief has a reach that no other charity can match. It has easy access to celebrity endorsement, and to prime time telly. It's fun and glamourous, making us feel good about giving. It shouldn't feel like a chore, which is vital as, according to the Ipsos Mori survey, people feel less and less that giving to charity is an obligation. If they don't feel they should donate, then the trick is to make them want to pull out their wallet. There's also the incredibly strong branding. Red Nose Day is instantly recognisable, and people get what Comic Relief is and what it stands for in an instant. Meanwhile, there are 23 charities in England and Wales with autism in their name, eight of those in London. Who do you choose to give your hard-earned cash to? Why should you bother? Depressing as it seems, market forces are making a big impact on the Third Sector, and charities need to respond in order to survive. Comic Relief offers some lessons, but at the same time it's a brand and a business model apart, with resources and connections that most charities can't even dream of. In an age when the Third Sector is feeling the squeeze from every direction at once, the success of Comic Relief only brings their own problems into ever starker focus. And that, frankly, is no laughing matter. The crosspoints between high technology and high fashion have always been a prime source of fascination for this blog. 3D printing has already made it possible for designers to create and prototype jewellery and footwear directly from the computer screen to the palm of their hand. Companies like Shapeways will allow you to fire up a CAD package, whip up a bracelet or ring and send it to their printing works. A week or so later, it's delivered to your door. And we're not talking something made out of cheap plastic either. Ceramic and metal objects can be created easily. This brings up all kinds of interesting questions. If you can print your own clothing to your exact specifications, then what exactly are clothes shops and designers for? Is it likely that, say twenty years in the future, Top Shop would have gone the way of HMV? I don't think so. For one thing, designing your own clothes is a bit more difficult than popping to the shops for a quick retail fix. And, for the time being at least, it's not a cheap option. It would be interesting to see a simpified model for this, whereby you can customise existing profiles, tweaking them for an exact fit or the perfect colour. The notion of clothing coming in off-the-peg sizing could change on the high street, bringing a more bespoke feel. If something's a bit baggy on the hips, just nudge a vector in a bit. From there, it's an easy step towards a 3D scan of your own body that you could upload to the site, and the clothing profile would automatically adjust to fit. That's something that I would be very happy to see--as a lanky, long-limbed bloke with no hips to speak off, buying jeans that fit and shirts with long enough sleeves is something of a chore. Of course, you could argue that this is a model that Pier32 has embraced for years. A huge range of clothes in a wide variety of styles and colours, that you can customise with your own artwork? We've had you covered on that front since 1984. Another heads-up from The Tweed Pig, a blog with which I'm completely obsessed at the moment. The wry humour and high desirability of the products featured is turning my head in a fairly significant way. Who knows, I could be dressing like a country gentleman by the end of the year. Today I find myself wandering with a kind of dazed, blissful grin on my face around the website for Norfolk-based atelier Old Town. Although I doubt they'd appreciate being called that. The focus is on solid workwear and tough utility clothing, with a styling direction firmly pointed at the first half of the 20th century. Lots of twill, canvas and tweed. Clothes that are designed to perform and to last. ...we hope that the discerning might notice that the garments are essentially useful items with reference points and influences from past costume. In much the same way as today’s townscape is made of elements from different periods, we attempt in a simple way, to play with the notion of Now and Then. This is an interesting point. Good design has an awareness of history, of ideas that have worked well and that were perhaps needlessly abandoned. If an item makes you feel good when you wear it, then why should it matter that it doesn't fit in with current trends? Will we look back at the onesie in a couple of years with a sense of bemusement--or will we all be wearing them? Bear in mind of course, that the boiler suit has been around for a while. That's nothing more than a onesie in slightly better fabric. Old Town clothes are made to order, and take between six to eight weeks to arrive at your door. I think that's fair enough. If you have to think hard about what you want to buy, rater than just yank out your credit card on a whim, then you're ascribing to the mantra that's increasingly quoted in this blog: Buy Less. Spend More. Choose Well. Old Town are based in Holt in North Norfolk, one of my favourite spots in the country. The town is worth a visit if you're ever in the area, and I'd say Old Town is definitely worth the trip all by itself. For more, check out the website, and I urge you to nose through their News Extra archive--plenty to see and read. Can You Get Sustainable Sunglasses? Here's The Proof! Eyewear is probably more sustainable than you'd think. It's not that difficult to pick up vintage frames (most decent antique stores will stock a selection, and at big fairs and markets like the one on Portobello Road in West London, there are often stalls that will sell nothing but) and retrofit them with your own prescription. Or, if you're a hipster and you just like to look clever, plain glass. If you absolutely must have new, then your best option comes out of Eagle, Idaho, from a company by the name of Proof Eyewear. The brainchild of three brothers that come from a wood-working background (their Grandpa Bud ran a sawmill), Proof make all their shades by hand from a wide range of recycled and sustainable materials. Plant-based acetates in bright colours are teamed with woods like bamboo, with some veneers coming from recycled skateboards. Even the metal fittings are pre-loved. Every pair of sunglasses that comes out of the workshop has its own story to tell. On top of that, the Proof boys donate a fat chunk of their profits to an Indian non-profit that's providing sight-saving cataract surgery to the poor and needy. These guys are doing the right thing in every way. The shades have a sunny Californian vibe and a classic hint of Americana, backed up with craftsmanship, passion and compassion. 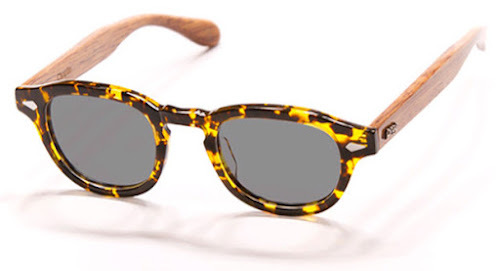 If you're in the market for a new pair of shades this summer (and lord knows, we're due some sunny weather) then why not bypass the Wayfarers, and try out something with a little bit of ethical cool? Proof Eyewear retails for $90-115. For the full range, check out their website. My discovery of the week has been clothing blog The Tweed Pig. They highlight the very best of traditional and classic English design. It's a surprisingly broad remit: the smooth Sixties style of icons like Dirk Bogarde, Patrick Magee as John Steed, and the sharply tailored look of Michael Caine as Harry Palmer beds in nicely with the hard-wearing clothes of the huntin' and shootin' set. Then there's the bespoke end of the market--Saville Row and the tailors of Mayfair. Clothes made to exacting standards by skilled craftsmen from high-end material. It costs a fortune to have a suit made. But that's not a bad thing. Saville Row ties in beautifully with Pier Crush Vivienne Westwood's mantra of Buy Less, Spend More, Choose Well. Sure, there's a massive initial investment in a suit from a Mayfair tailor. But that suit will very likely last you a lifetime. Choose Welsh wool or Scottish tweed, and you're getting material from local, highly sustainable sources. And of course, you're supporting local craft and skill all the way, from the cutters and sewers to the people that make the buttons. A decent suit should make you feel like a million dollars. If you've only paid a grand for it, then surely that's a bargain. There's a distinct uptick in sales out of Saville Row, with more modern designers taking their place alongside the traditionalists, sleekening the profile, but applying the same care and attention to detail for which Mayfair has always been renowned. As a gent of a certain age, the whole area is fascinating me more and more. Good, long-lasting, well-made clothes are absolutely at the heart of ethical fashion, and it's important that we see past petty snobbery and embrace bespoke clothing as an important strand of the market. 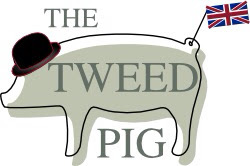 Take a look at The Tweed Pig for a dryly witty look at the world of traditional English design and fashion. It's well worth a browse. We're Fighting Homelessness With Dean Porter And The Big Issue! Homelessness is once again on the rise, with drops in benefit and the "bedroom tax" making it more likely that hard-working people on the financial razor's edge will lose their homes and be forced out onto the streets. It's a terrible situation to find yourself in, and here at The Pier we want to make sure that homelessness becomes a historical aberration rather than stark reality. 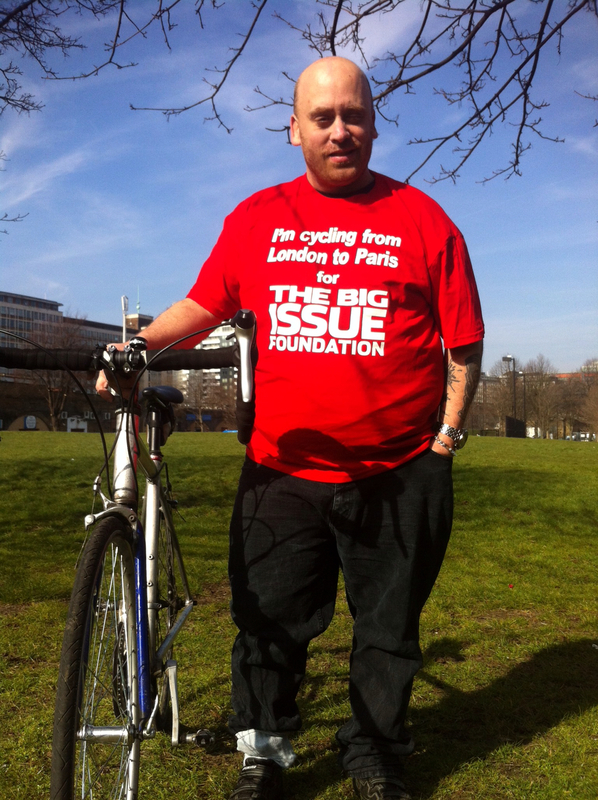 For the second year running, we're teaming up with The Big Issue as they ramp up sponsorship for their London To Paris Bike Ride in July. 230 km on two wheels, except for the bit across the Channel, which is by pedalo*. Big Issue vendor Dean Porter is doing the ride, and Pier32 have happily provided T-shirts for him. Dean popped into the Big Issue offices yesterday (Monday) to check out the wares, and we have to say: doesn't he look the business? If you fancy joining Dean on the ride, you can sign up at the Big Issue website. It takes place from the 18th-21st of July, ending in time for you to check out the final stage of the 100th Tour de France in Paris. Sounds too much like hard work? 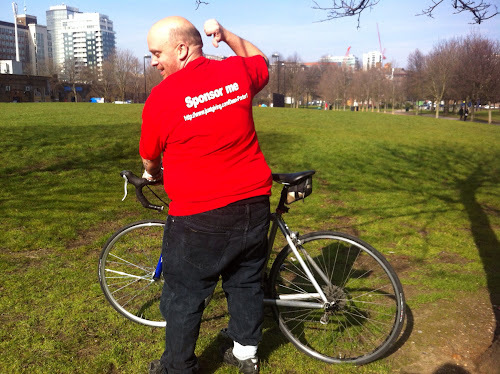 Why not just sponsor Dean instead at his JustGiving page? Let's face it. It's cold out there, and the streets are no place for anyone to spend the night. Join us and Dean, and let's ride homelessless out of town. *not by pedalo at all. I have to admit to a fondness for unusual watches. I'm enthusiastic about esoteric movements and innovative materials. Needless to say, then, I'm a sucker for Sprout Watches. This Long Island based company are really pushing the boundaries of what you can do with eco-friendly materials to create good-looking timepieces. They use corn resins, which are biodegradable and, unlike conventional plastics, don't use oil resources. Biodegradable doesn't mean they'll fall off your wrist in a hurry, though: Sprout watches come with a lifetime guarantee. The watches are exclusively powered by mercury-free batteries, helping to keep that nasty toxin out of the ecosphere. They'll even recycle it for you when it runs out. None of which would mean anything if the look wasn't right. Which, I'm happy to confirm, it is. There's a wide range of womens, mens and kids styles to pick from, including some water-resistant models. There's a chunky, Ice Watch aesthetic at play which is going to play very well with the trendies. Sprout also have a time-teaching clock, and they've even moved into a neat little range of recycled shopping bags. Sprout Watches are fun, inexpensive and seriously eco-friendly. Watch out for these guys.